Senator Tom Cotton (R., Ark.) went after Sen. Claire McCaskill on Saturday for her decision to vote against confirming Gina Haspel as CIA director, which he said showed she values "obstructionist politics" more than "keeping this country safe." "McCaskill proved once again that she is so liberal, and so reflexively opposed to the president that she cannot represent Missourians in the Senate," Cotton told reporters on a conference call organized by Republican Josh Hawley's campaign to unseat the two-term Democrat. "She put partisan politics over national security." The Senate confirmed Haspel on Thursday in a 54 to 45 vote, with 6 Democrats putting her over the threshold. McCaskill gave no clue into where she was on Haspel until she voted no, saying Haspel lacks the "moral compass" to lead an agency with as little oversight as the CIA. "I need to have confidence that the person running it has the instincts and judgment to make decisions in line with our country’s moral compass," McCaskill said. "While I respect Ms. Haspel’s service and sacrifice, after meeting with her and reviewing classified documents, I do not think she is that person." 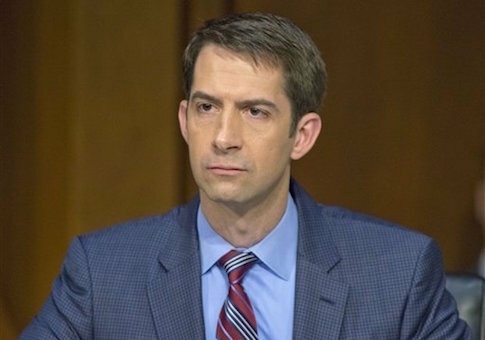 Cotton, whose home state borders Missouri, said McCaskill's opposition to Haspel was made worse by her refusal to "own up to her vote." "McCaskill couldn't even own up to her own vote—she declined to take a position until the very last moment, and then after voting she wouldn't even post a statement defending her vote," Cotton said. "McCaskill ultimately can't hide from the people of Missouri. Missourians will remember in November that McCaskill apparently cares more about Chuck Schumer's obstructionist politics than about keeping this country safe." Cotton said he was "personally affronted" by McCaskill's choice to call into question Haspel's morality, pointing to Haspel's service for the country in the immediate aftermath of the September 11 terrorist attacks. "Haspel put herself and her reputation, and in some cases her life, on the line to protect this country," he said. "That shows a moral compass and reflects American values, and I am personally affronted that McCaskill would suggest otherwise." "I think Missourians will be appalled that McCaskill claims Haspel lacks a moral compass or doesn't reflect our values because she might have at one point in her life been too tough on terrorists," Cotton said. Cotton said he was "mystified" by the decision to side with the liberals who opposed Haspel rather than with Sen. Mark Warner (Va.), the top Democrat on the Senate Intelligence Committee, and Obama administration intelligence officials who supported her. "There are liberals in all 50 states, you have them in Missouri and we have them in Arkansas, but they're not a majority," he said. "Ultimately, the people of Missouri want someone in the Senate who will put national security first and put aside partisanship." He predicted Hawley would be an "independent voice who would support the president when he's right and try and change his mind when he's wrong." Hawley had urged McCaskill to vote for Haspel and reacted to her eventual no vote by labeling her "a hard partisan who only cares about obstructing the Trump agenda." This entry was posted in Politics and tagged CIA, Claire McCaskill, Gina Haspel, Josh Hawley, Missouri, Tom Cotton. Bookmark the permalink.